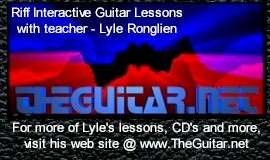 Teacher: When your guitar is tuned to an "open tuning" this means you can strum all the strings open (without using any fingers) to make a full chord. This is ideal when using a slide because the slide acts as a bar when laid across all the strings enabling you to slide to any chord without using your fingers on the frets. Teacher: Let's start with our guitar in standard tuning: E A D G B E. In order to change this to open G tuning the strings must change to D G D G B D.
Teacher: This lesson uses 3 chords; open G, C at the 5th fret and D at the 7th fret. G can also be played at the 12th fret which is one octave higher than the open G. I'm using acoustic tonight but you can use electric too. Teacher: Examine and learn the first riff. Notice you're following the chord progression with the slide. 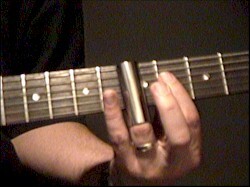 Note: Make sure your slide is on top of the fret, not between them to be in tune. Teacher: When you use an open tuning like this, it's a good idea to make use of the strings that have been changed like the first string. You can't get that sound with a slide in standard tuning. Notice in riffs 1 and 2 you strike the first string in almost every chord. Teacher: I've got a couple variations for you to learn for both chord progressions. Teacher: This next riff can be used against jam track - part 1. Rich: Are you using a pick or finger picking? Teacher: I'm using a pick to get a louder sound from my acoustic. roy: Glass or metal slide? Teacher: I like to use metal, I keep breaking the glass ones. roy: I have small fingers, do they come in different sizes? Teacher: roy, they come in all sizes, jimdunlop.com is a good place to look at many different slides. Teacher: Here's another riff, this time it's the alternative chord progression like you used in riff 2. Teacher: If you play all 4 riffs back to back, you'll be playing exactly what is in the Lesson Sample. Every 4 measures the chord progression changes between the two different patterns.